By popular demand our CPK FUNdraiser is back! Are you on Team Pasadena? Team Northridge? Team Encino? Or will you be joining Team DTLA at 7th and Fig? We've also added two new locations-Hollywood and Tarzana, so gather some friends and get your pizza on! On March 13th, bring this flyer to one of the SIX participating California Pizza Kitchen restaurants and 20% of your check will go to the Angeles Chorale! The FUNdraiser is valid all day on dine-in, take-out, curbside, catering and delivery when ordered directly from the restaurant. 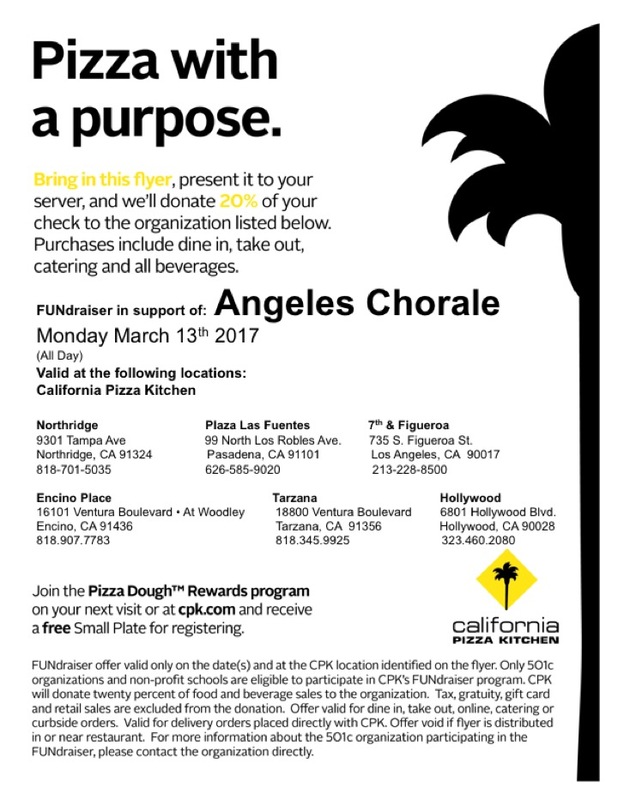 On Monday, March 13th, bring this flyer to a participating CPK Restaurant and support the Angeles Chorale by eating pizza!